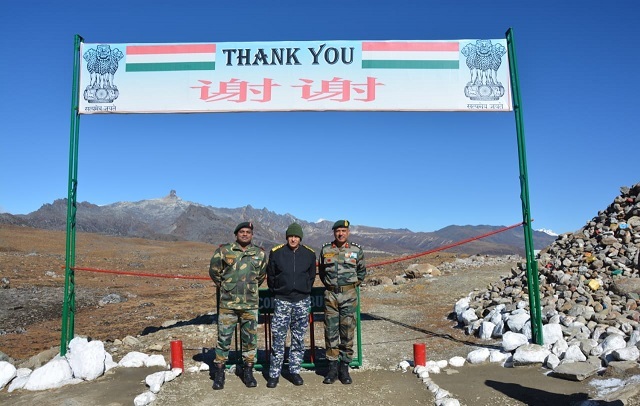 Chief of Indian Naval Staff Admiral Sunil Lanba visited the strategic Bumla Pass on the Line of Actual Control in Tawang Sector. Chief of Indian Naval Staff Admiral Sunil Lanba visited the strategic Bumla Pass on the Line of Actual Control in Tawang Sector. The Admiral who is also the Chairman Chiefs of Staff committee was briefed on the security situation and the important activities involved in peaceful management of Northern Borders. Bumla is one among the five established meeting points between Indian and Chinese Army to resolve issue along the 4057 km long sensitive LAC. Earlier in the day, he also paid homage to the martyrs of 1962 operations at Tawang War Memorial as well as at the Memorial of Subedar Joginder Singh, Param Vir Chakra at Bumla. The Chairman appreciated the operational readiness of the formation and exhorted the troops to maintain constant vigil for any unforeseen contingencies along LAC.